Visit North Rhine-Westphalia western Germany. Cartrawler search engine will help you find the best rates on car hire from Cologne Bonn Airport. Booking car hire online is often considerably cheaper than renting directly form a rent a car supplier. The Polo, a reliable economy model from Volkswagen is amongst the cheapest hire cars in Germany. Numerous reasons bring visitors to North Rhine-Westphalia state in Germany. Once known as the ‘Land of Coal and Steel’, this region of western Germany has come a long way developing from a solely industrial area into a major centre of German economy, education and culture. Find more information on Cologne tourism. North Rhine-Westphalia today is one of the most prosperous German states and a home to 14 universities, several World Heritage Sites and headquarters of many major corporations. 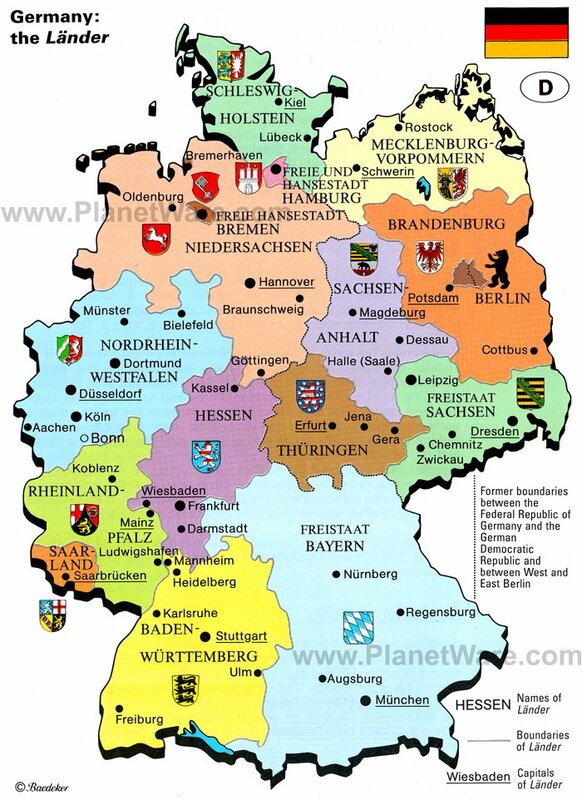 Find North-Rhine Westphalia on the map of German states. The capital of North Rhine-Westphalia is Düsseldorf and its largest city, Cologne, or Köln, in German. The city of Cologne is served by an international airport, known as Cologne Bonn Airport, or shortly, Cologne Airport - CGN. In Germany the airport is also referred to as Köln/Bonn-Konrad Adenauer airport. It is located approx. 9 miles southeast from Cologne and 13 miles north of Bonn. See location map of Cologne Bonn Airport. Weather you arrive to Cologne as a tourist or in business, a rental car picked up from Cologne Bonn Airport is a convenient and, often, very affordable means of moving around. Ford Mondeo hatchback, often available at competitive rates in Cologne-Bonn; in the fleet of, for example, Buchbinder. Rental cars at Cologne Bonn Airport are available from major car hire providers, such as Avis Rent A Car, Alamo, Buchbinder, Budget, Dollar, Enterprise, Europcar, Global, Hertz Car Hire Germany, Interrent, Keddy, Sixt Mietwagen an Thrifty. Use Cartrawler search engine to compare prices and rental conditions from many providers in hundreds of destinations in Germany and worldwide. The best car rental deals at Cologne Bonn Airport are usually found within the economy class: a 7-days rental of a VW Polo, Ford Fiesta, Skoda Fabia, Renault Clio or similar with the pick-up at the airport (CGN) is often priced at approx. £140-150. Usually, there is no significant difference in price between the economy class cars to rent at Cologne Bonn Airport and the smallest city cars, such as Opel Adam, Volkswagen Up, Ford Ka, or similar. Book in advance to ensure the best prices and availability, especially if you are interested in renting a more specific type of a car, as for example an SUV or a minivan. Much like anywhere else in Europe, Toyota RAV4 is one of the most popular SUVs to rent in Germany. To cater for the needs of business travellers visiting this part of Germany, Cologne Airport rental fleet includes also a wide selection of cars in the premium and luxury class. People carriers for larger groups are also available. VW Sharan, a 7-seater MPV to rent in Germany. Cologne Bonn Airport is a major hub for the for the budget carrier Eurowings, offering a wide choice of low-cost routes within Europe, including routes to London (Heathrow and Stansted). More cheap flights from the UK to Cologne are available with Ryanair with departures from London-Stansted, Bristol and Manchester. Cologne (Köln) can also be reached from major European cities, amongst them Rome Fiumicino, Milan-Malpensa and Stockholm with low-cost and regular airlines. The airport is located halfway between Cologne and Bonn, within a thick network of major motorways allowing quick access to major cities of the region. See map of major roads of North Rhine-Westphalia. Book cheap car hire at Cologne Bonn Airport with Cartrawler Germany. Compare prices from Avis Rent A Car, Europcar, Hertz and Sixt Mietwagen Koln. Cheap flights to Cologne Ryanair and Easyjet. North Rhine Westphalia.